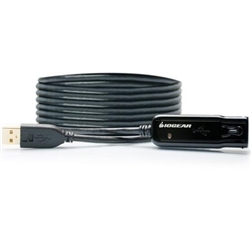 The Iogear 39 feet (11 m) USB 2.0 Booster Extension Cable uses active electronics to amplify the USB signal beyond the USB 2.0 specification of 15' (4.5 m). It does this with no loss of data integrity. The Iogear USB 2.0 Booster Extension Cable extends from the host and provides another female "A" connector for longer distance USB needs.